Its so predictable. A big snowstorm or colder temps bring out the climate deniers. This week’s historic deep freeze spreading across the Midwest, North East and as far south as Atlanta (just in time for the Super Bowl) may leave you wondering, if the world is warming, why are we seeing colder temps? It’s actually ironically more proof of climate change. Two reasons: more cold air is coming down by land and less warming is coming by sea. 1. The polar vortex is usually blocked by temperature differences. The cold arctic weather is blocked by a life preserver of warm air, driving the jet stream in a tight circle. But as sea ice disappears, the arctic region warms faster than the rest of the planet. So the temperature DIFFERENCE has dropped. This makes the polar vortex more squirrelly because the jet stream punches through a weakened barrier. This is happening more often, bringing bitter cold deep into the eastern half of the US. But as Greenland melts,the fresh water blocks the seawater, slowing the cyclic flow. 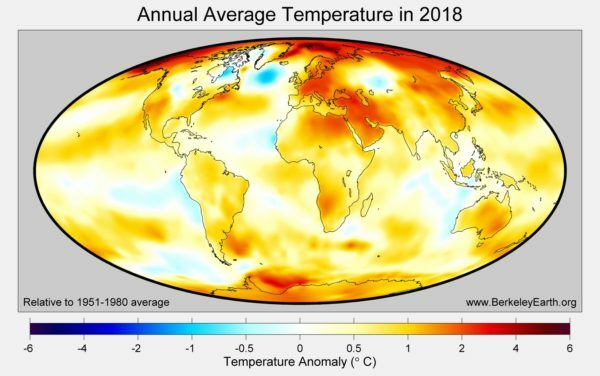 Look at the map of global warming temps. Look at the dark blue dot by Greenland. Smack dab on the peak of Gulf Stream.